Knockout Tested Mouse monoclonal Nestin antibody . Validated in WB, IP, ELISA, IHC, ICC, Flow Cyt, ICC/IF and tested in Human. Cited in 25 publication(s). Independently reviewed in 5 review(s). Based on the result of immunocytochemistry on mouse and rat neural stem cells, this antibody has no reactivity with rodent Nestin. The clone number has been updated from (3k1) to (196908) both clone numbers name the same antibody clone. Nestin-transfected NS0 cells transfected with a human Nestin fragment aa residues 618-1618. Human neural progenitors and A172 cells. Our Abpromise guarantee covers the use of ab6320 in the following tested applications. IHC-Fr Use a concentration of 0.1 µg/ml. When using aldehyde-based fixative, use at a concentration of 5 µg/ml (see Abreview). ICC Use a concentration of 5 - 10 µg/ml. Tested in human neural progenitors and A172 cells. Cells were fixed with 4% paraformaldehyde and 0.15% picric acid in PBS at RT for 20 min. Flow Cyt Use a concentration of 25 µg/ml. Lanes 1 - 2: Merged signal (red and green). Green - ab6320 observed at 300 kDa. Red - loading control, ab176560, observed at 50 kDa. ab6320 was shown to recognize NES in wild-type HAP1 cells as signal was lost at the expected MW in NES knockout cells. Additional cross-reactive bands were observed in the wild-type and knockout cells. Wild-type and NES knockout samples were subjected to SDS-PAGE. Ab6320 and ab176560 (Rabbit anti-alpha Tubulin loading control) were incubated overnight at 4°C at 1 μg/ml and 1/20000 dilution respectively. Blots were developed with Goat anti-Mouse IgG H&L (IRDye® 800CW) preabsorbed ab216772 and Goat anti-Rabbit IgG H&L (IRDye® 680RD) preabsorbed ab216777 secondary antibodies at 1/20000 dilution for 1 hour at room temperature before imaging. Immunocytochemical analysis of human fetal neural progenitor cells, labeling Nestin with ab6320 (10µg/ml). Immunostaining was for 3 hours at room temperature. Counterstaining with DAPI (blue). Immunohistochemistry (Frozen sections) - Anti-Nestin antibody  (ab6320)Image from Griffero F et al, J Biol Chem. 2009 Mar 13;284(11):7138-48. Epub 2009 Jan 14, Fig 1. Tumorigenicity of human glioma-derived cells. 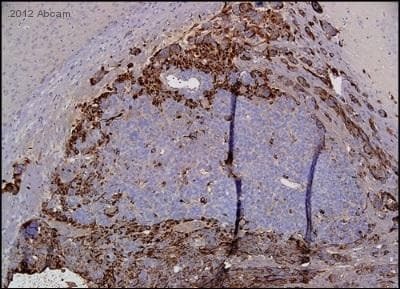 Representative immunohistochemical analysis of brain tumors generated after orthotropic injection of isolated human glioblastoma cells. Immunofluorescence of mouse brains cryosections labeled with anti-human nestin antibody. A, diffuse infiltration of the injected and contralateral hemisphere (GBM 1). B, cells infiltrating the striatum ipsilateral and contralateral to the side of injection (GBM 2). Scale bar, 100 µm. GBM xenografts recapitulate the morphology of corresponding tumors in human cancer patients. ab6320 staining Nestin in Human glioblastoma in mouse brain by Immunohistochemistry - Wholemount. Samples were incubated with primary antibody (1/1000 in diluent) for 16 hours at 4°C. An HRP-conjugated goat anti-mouse polyclonal IgG was used as the secondary antibody. Publishing research using ab6320? Please let us know so that we can cite the reference in this datasheet. One lot gives patchy staining but other lots have given perfect results for 8 months. Human neuronal precursors. 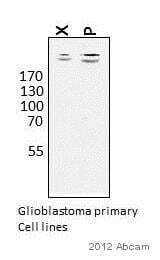 Thank you very much for your call yesterday, and I apologize for the variation of results using this antibody. As we discussed, I'm sending two free of charge vials to Cedarlane, who will then forward the replacement vials on to you. Please keep me updated about the results using the new vials, and let me know if you have any questions or need anything else. Have a nice day! please find attchaed protocol that you requested. Thank you for your reply with this information. Regarding your protocol - one thing that really stood out is the use of Triton as a permeabilizing agent. This detergent will also partially dissolve the nuclear membrane and will disrupt proteins when used at higher concentrations for longer periods of time. We typically recommend using it at 0.1-0.2% for 10 min only. Since both of these proteins are cytomplasmic, permeabilization with tween 20 is sufficient (I recommend 0.2 % for 10 - 15 minutes). This should decrease the amount of background and non-specific stain you are observing. Additionally, I would recommend optimizing the conditions with each antibody individually rather than in sequential staining. to not have this problem. I am sorry that you have been experiencing difficulties with these antibodies in ICC. I have reviewed the images provided, but I was wondering if you would also provide a detailed summary of your protocol and sample preparation. This will help me to evaluate if there are any suggestions I can make to improve your results or if the antibodies are faulty. I look forward to your reply so that I may assist you further. Please do not hesitate to contact me with any additional questions or concerns. Multiple bands in Western blot. Thanks for your call today and for letting us know about the problem with ab6320. As we discussed, I am sending a free of charge vial of ab22035 on the order ***, which I expect to arrive tomorrow. Please keep me updated of the results with this replacement antibody. If you have any images to send, you can just reply to this email and it will go straight to me. This will help us determine how to fix the issue with ab6320. Please let me know if you have any questions or if there is anything else that we can do for you. I am currently using your ab6320 (Nestin) antibody. What are the differences between this new antibody and your ab6320? Note: I am using ab6320 on human primary cells. Thank you for your enquiry. Ab27952 is a rabbit polyclonal antibody to nestin, and ab6320 is a mouse monoclonal antibody. The immunogen used to generate ab27952 was a KLH conjugated peptide to the human nestin tail. The immunogen used to generate ab6320 were nestin-transfected NS0 cells transfected with a human Nestin fragment aa residues 618-1618. Ab27952 detects human and mouse nestin while ab6320 detects human nestin and has no reactivity with rodent nestin. Please contact us again if you have any additional questions.